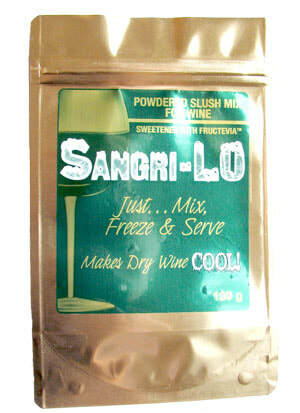 Sangrilicious is a wine slush product that lets you enjoy dry wines in a whole new way. Sangrilicious has a fruity sangria-like flavor and is a cool refreshing way to enhance the flavour out your wine. Equally suited for back yard get-togethers or indoor parties anytime of the year. Simple to make and no special equipment needed. Many of you will remember purchasing our Vinolicious. Sangrilicious is the same product with the same great flavour but with a little less sugar and new packaging labels. We have changed the name to better reflect the sangria-like flavour and to compliment our newest product the more diabetic friendly Sangri-LO. We have also standardized the back labels of both products to allow you to more easily compare ingredients and nutritional information. We hope you like the changes and we hope you will continue to enjoy our great wine slush products. Same great flavour but a wine slush mix that we believe is “more diabetic friendly”. 1. Empty a package of slush mix into a large bowl. 2. Pour in a bottle of dry red or white wine - depending on your preference (Non-alcoholic wine can be used if you like). 3. Fill the empty wine bottle with water and add to the mix (Tip: I use warm tap water to dissolve the mix quicker). 4. Whisk or stir to dissolve the slush mix completely. ​5. Taste the liquid. If you find it too sweet for your tastes, add a bit more wine & water in equal proportions until you get the sweetness level you like. 6. Divide the mixture into containers or zip-top bags and freeze for 5-8 hours (The smaller the container or bag, the faster the mixture freezes). 7. Thaw to a slushy consistency and enjoy! If the mixture melts completely before you get it all used, just re-freeze as necessary. Spoon slushy mixture into glasses. ​Try adding a splash of sparkling wine or soda water to give another dimension to the drink. ​You can also add small chunks of fresh fruit.